We’ve released a new version of Power BI Premium Capacity Metrics app, version 1.10.1.1, with new system metrics by workloads, and total active dataset size in memory metrics. In the Power BI Premium Capacity metrics app, on the Resource consumption tab, you’ll see a new CPU Consumption chart. In addition to the overall capacity level system metrics, workload level system metrics are overlaid. This provides maximum data values calculated over hourly time windows, measuring the percent of CPU utilized split between different workloads running on the capacity. Also new on the Resource consumption tab is the Memory Consumption chart. In addition to the overall capacity level system metrics, the workload level memory consumption along with the workload limit (dotted lines) are overlaid in the same chart. This provides easier comparison of maximum data values calculated over hourly time windows, measuring the memory consumption in GB split between different workloads running on the capacity. The Consumed Memory Percentages chart appears in the datasets tab in the Power BI Premium Capacity Metrics app. Total active datasets size in memory metric allows admins to see active vs. inactive memory to help determine more easily if the memory is getting full. To learn more about these and other metrics in the app, see Monitor Premium capacities with the app. This same app can be used to monitor Power BI Embedded A SKU capacities. This can be done by opening your capacity in the Azure portal, clicking on Access control (IAM) and adding the Power BI Premium Capacity Monitoring app to the Reader role. If you’re unable to find the app by name, you can also add it by its client Id: cb4dc29f-0bf4-402a-8b30-7511498ed654. If you have a previous version of the app already installed, it’s best to delete it from your apps and then hit CTRL-F5 to refresh to avoid confusion with versions. The app can be installed by searching for Power BI Premium Capacity Metrics in Power BI apps or by clicking here to get it now. Once the app has installed, wait a few minutes for the datasets to complete refresh before accessing the report. 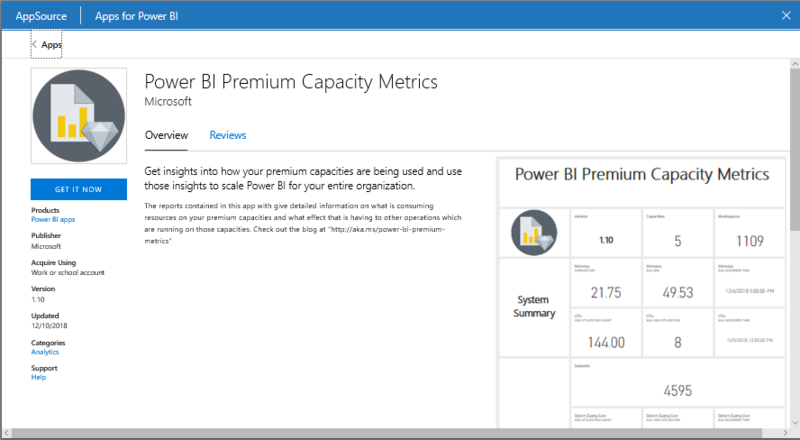 To learn more about monitoring your Premium capacities with the app, see Monitor Power BI Premium in documentation. Be sure to submit your ideas for more any suggestions. You can now restart a capacity from the Admin portal. Sometimes certain design aspects of a data model can lead to poor performance of a specific report or dashboard in the Power BI Service. This can prevent a dataset from being evicted since the capacity still thinks it’s being queried. This can create undesired wait times for other refreshes, failed refreshes, and unusually long running queries – all visible in the metrics app. When these occur, the capacity metrics app will show high memory utilization. When you restart a capacity, all ongoing scheduled and ad-hoc refreshes are stopped. Refreshes are restarted when the capacity is available. Users interacting with the capacity will lose unsaved work. They should refresh their browsers after the restart is complete. All the saved data, definitions, reports, and dashboards on your capacity remain fully intact after restart. To learn more, see Restart a Premium capacity.